Shaggy black fur and large size distinguish this animal from all other Adirondack mammals. The black bear has a short, inconspicuous tail. The body and legs are short. The head is broad with erect, rounded ears. The muzzle, grizzled with brown, is long and narrow. The eyes are small and dark. Both front and hind feet have five toes, each with a large claw. A white blaze is often present on the throat or chest. Color phases occur but are uncommon in eastern populations. Adults are approximately 50 -78 inches in length. Average-sized adult males weigh 300 lbs. and females 150 lbs. Remove bird feeders after April 1. New York’s black bears begin emerging from their winter dens in mid to late March. Bird feed such as suet and seeds are a very strong attraction for bears, even if they can’t reach it. Read more about bears and bird feeders. Garbage is extremely attractive to bears! It should always be kept in sealed garbage cans inside a sturdy building like a garage or shed. Anything with an odor can attract a bear. Note: Burning garbage is illegal and may increase its attractiveness to bears. Image of a bear resistant residential garbage can. Remove the grease can from grills after every use. Turn the grill on “High” for several minutes after you are done cooking to burn residual odors off the grill. Do not place food outside to attract wildlife. 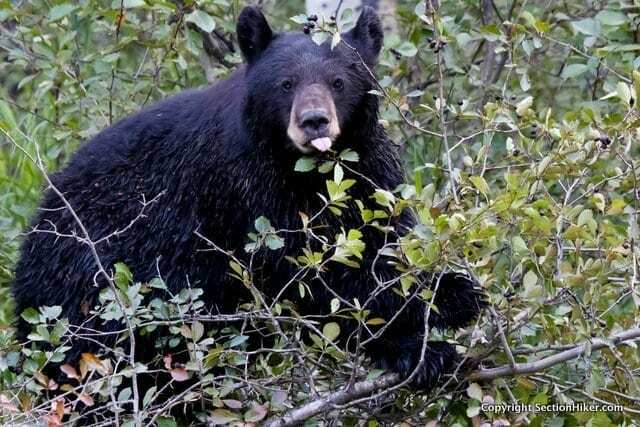 Any food stuff used to attract birds, squirrels or other wildlife will also attract bears. A sow black bear and her cub attempting to get food out of a standard cooler at a campsite. Standard coolers are not bear-resistant! Bears are intelligent and persistent, making unattended coolers an easy target. Keep your campsite as clean as possible. Take all garbage and recyclables to the recycling center each evening. Do not leave coolers or food out at any time. Store them securely in either the trunk of your car or in the cab of your truck. Keep windows shut and food and coolers out of sight. Where food lockers are provided, food and coolers must be stored and locked inside. Standard coolers are not bear resistant. NEVER keep food, coolers, or scented items in your tent. Do not wear clothing to bed that was worn while preparing or eating meals. Treat all toiletries as food items. Toiletry products are heavily scented and are as attractive to bears as actual food. Store toiletries securely with your coolers and food. Clean up after all meals immediately. Keep grills, pots, pans, cooking utensils, and wash basins clean when not in use. Do not wash dishes or leave food debris under the water faucets. Do not put grease, garbage, plastic diapers, cans, bottles or other refuse into the fireplace. These items do not properly burn and will attract bears with their odors.